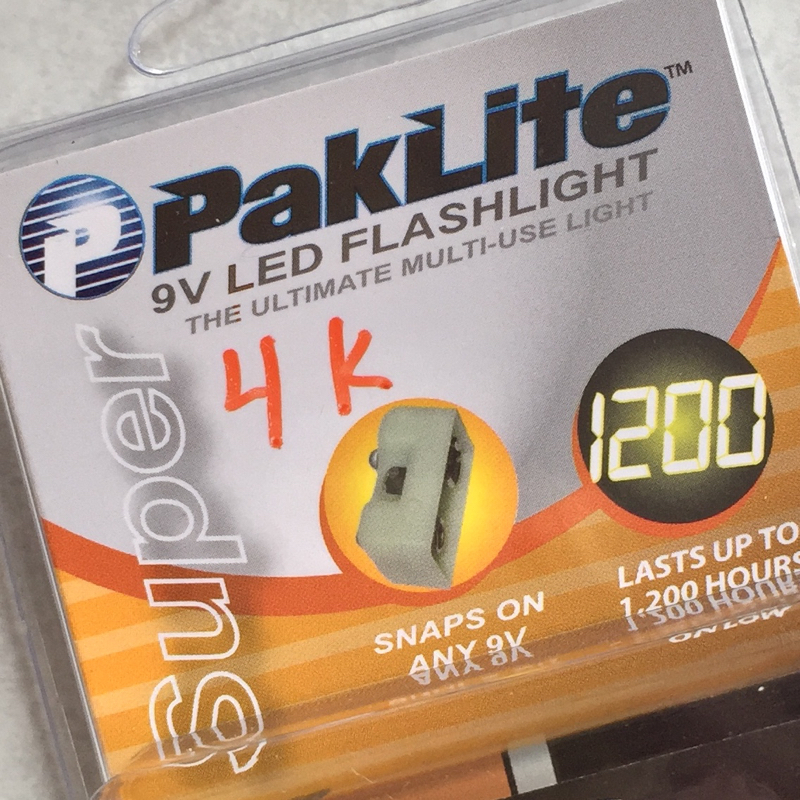 Today’s mail call brings us the Pak-Lite Super 4K, a new offering from Oregon flashlight maker Pak-Lite. If you find yourself needing a long-running flashlight for disaster preparedness or a survival kit, this would be a great light to put on your short list. Pak-Lite is a small family-run business nestled in the mountains of Southern Oregon, and they’ve been cranking out small 9 Volt LED flashlights for what must be close to 15 years now. Their lights have been used worldwide by the military, government agencies, relief organizations, etc. Their gear is definitely robust and it just plain works. Heck, I’ve got an older model Pak-Lite that has been carried & tossed around in survival kits for over a decade, and it’s still going strong. Enter this new 4K model. They’ve upgraded the LEDs to the warm white variety, and the “4K” designation means the approximate color temperature output. Instead of the blue / purple tint of older LEDs, these newer warm white versions are a lot more pleasing to the eyes. Various colors also appear a bit more natural, and this could definitely be an advantage when doing detailed tasks such as map reading. According to the manufacturer’s specifications, runtime is the same on the 4K version. You’ll get 30 hours on high mode (600 on low) with an alkaline battery, or 80 hours on high mode (1,200 on low) with a lithium battery. Personally, I’d opt for the lithium battery, especially since you’ll get a better runtime, longer shelf life, and less chance of a leak compared to alkalines. Honestly, this mail call writeup could just as well be titled as a long-term review. The Pak-Lite 4K, and Pak-Lite in general, is a “KISS” piece of gear. (See the previous review for the standard model Pak-Lite here). It’s reliable, it lasts, and although some might balk at the $20 price tag, that’s actually really cheap for a light made in the U.S.A. You don’t want to be wishing you spent the few extra bucks when the power goes out or the big quake finally shows up. Below are a few more photos showing color rendition between the 4K model and an older Pak-Lite, as well as a beam comparison (about 4 inches from the wall). Nothing scientific here, just a couple of quick shots in a dark room. Notice the blue and purple map shades being a little more subdued on the 4K model; this appears closer to what the naked eye sees. All images and content © 2018 of the respective author(s). No use without permission.